Hi folks, Doc here. This time let's take a look at a set that many of you may have owned and enjoyed when you were young, the 7½ Engineer set. As a midrange set, the 7½ was a popular entry in the Gilbert Erector line during the 1940s and 50s. 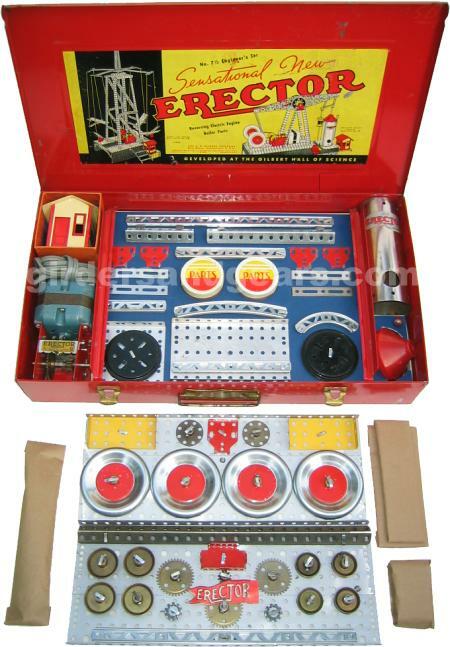 The set went through several incarnations, as did most Erector sets over time. The 7½ first appeared in 1934 as the "Automotive Set". The very next year Gilbert renamed it the "Engineer's Set". Except for a brief stint as the" Electric Engine Set" in the late 30s and early 40s, it remained the "Engineer's Set" until 1957. The set shown in this pictorial is the version from 1953. I acquired this set in reasonably good condition, and it needed only a set of replacement inserts and a few spare parts to bring it back to life. 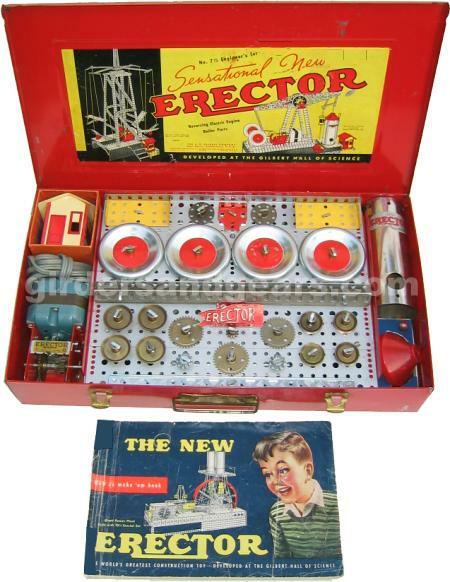 1953 marked many changes in the makeup of certain key Erector parts, and this set reflects several of those changes (see photos). For example, all gears and pulleys were now made of sintered metal, and the painted metal boiler top had been replaced with a bright red plastic version. Note, however, that although BT turret plates were cadmium plated beginning in 1953, this set still features the black painted versions from previous years. Gilbert was famous for getting rid of old stock in this manner, and this set is no exception. The box is (the now iconic) red painted steel, 18" long x 10" wide x 3" deep. The outside of the lid features the familiar yellow "kneeling boy" label, while the inside of the lid features a large red, yellow, black and white label that depicts the airplane ride and walking beam engine models. As the photos show, the parts were arranged in a packaging format that was typical for most metal-boxed sets. The A49 electric motor, T boiler, MX house, and U boiler top were stored in compartments on either end of the box. These compartments are separated from the central section of the box by two steel rails. These rails supported two part trays, each made from two MN 12" base plates (see photos). The trays held all of the wheels, pulleys, and gears, along with most of the girders. Beneath the trays was a second layer of parts, which included P79 car trucks, BN turret plates, and MD and MY base plates, among others. The parts were attached to a raised, blue cardboard insert panel with metal t-clips. Openings were cut into the insert to accommodate two part cans. Finally, the remainder of the parts, including ME and MF base plates, IE gearbox sideplates, hole strips, boiler stacks, and axles were wrapped in brown paper and stored either beneath the insert or inside of the boiler. The boiler top fit into a slot in a small insert that fit in the side compartment adjacent to the boiler. (Unfortunately, this compartment is so narrow that the edges of the boiler had to be squeezed together significantly in order to get it to fit in the space allotted for it). In 1955, a hole was added to the boiler top insert to accomodate a light bulb and socket.